In this episode of the DREAM. THINK. DO. podcast, Mitch Matthews talks with the partner and co-founder of Hashtag Legal, Jamie Lieberman. Her firm is dedicated to helping all entrepreneurs to run businesses in the digital age. She shares legal answers and specific strategies for some of the most common questions about the law. This information will help you and your organization stay protected. Talking about legal issues around your business and your creative ideas may make you want to run for cover. However, conversations around legal strategies to keep you, your ideas and your business protected shouldn’t be put off. Jamie Lieberman, my guest on today’s DREAM THINK DO episode, specializes in helping entrepreneurs run a business in the digital age. Her law firm has extensive experience in helping clients with everything from drafting and reviewing contracts to forming entities. Plus, she helps her clients to protect their creative ideas! 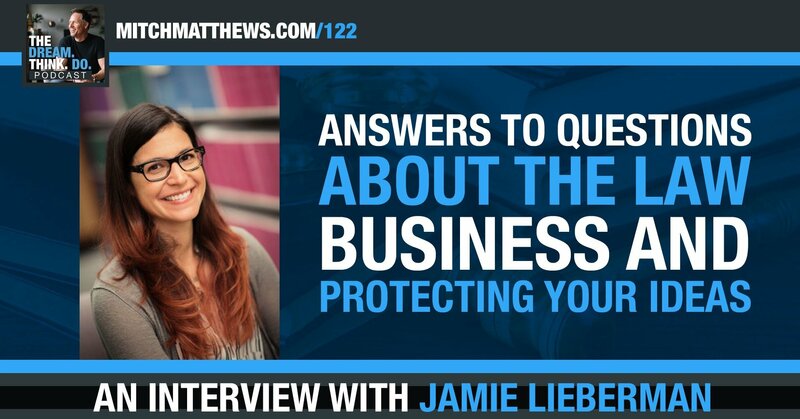 Listen to this episode to gain insight into how to do things right and keep yourself safe when it comes to business legal matters. You’ll hear answers to some of the most frequently asked legal questions from DREAM. THINK. DOers. Let me know what stood out to YOU! Leave a comment and share what was your biggest take away. I’d love to hear from YOU! DISCLAIMER: All information provided during this interview is legal information and does not form an attorney-client relationship. An attorney-client relationship is not formed until you have a written agreement between yourself and an attorney.